You've probably played Crossy Road at some point in the last few years. It's been successful to the point that it has created something of its own sub-genre in casual gaming. If you see a game with a title following the pattern of "verb-y noun," you probably know what you're getting into. The latest title in that category is Looty Dungeon. It's published by Yodo1 (like Crossy Road), and I'll give you one guess what it's about. Looty Dungeon is about traveling through a never ending dungeon collecting loot to unlock new characters, who in turn help you collect more loot. Did you guess right? I bet you did. 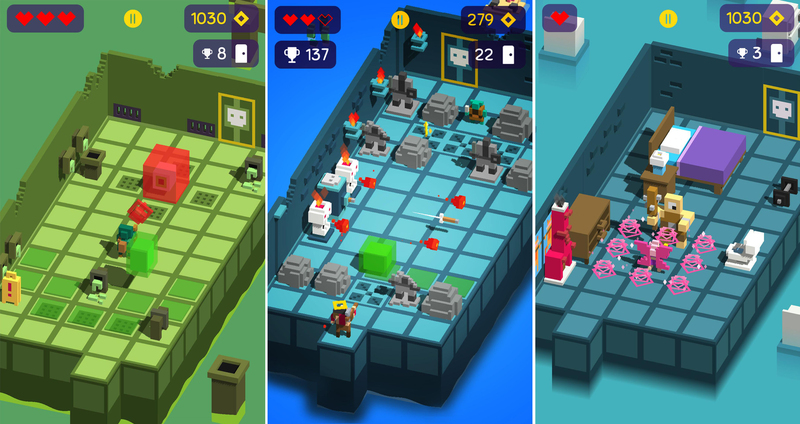 Looty Dungeon gives you control of tiny blocky adventurers to maneuver through rooms filled with traps and monsters. The floor also falls away behind you, so you need to keep moving. It has the standard voxel look with bright colors and an isomteric top-down interface. Looty Dungeon is free to play, and as is standard with verb-y noun games, you use the coins to unlock more characters. There are about 50 different characters to get in several different classes. There are only a few small in-app purchases, and they aren't pushed very hard. You can, however, choose to watch ads to earn extra coins. Enjoy your verb-y noun, everyone.